Fifteen FBS schools will have new head coaches when the 2015 season begins. This semi-regular piece will analyze the teams and the coaches they have hired in order to offer a prediction regarding the schools’ prospects for 2015 and beyond. Our fourth stop takes us to Sin City and the Rebels of UNLV. UNLV is not an easy place to win football games. Since 1990, UNLV has employed five head football coaches. Those five gentlemen, including one who won a previous mythical national championship at Southern Cal and one who produced an absurd winning percentage at FCS Montana prior to arriving on The Strip, produced a cumulative record of 89-205. For those new to college football, winning less than a third of your games is not typically the hallmark of a successful program. Their last three coaches have included an eventual College Football Hall of Fame inductee who won five Pac-10 titles and posted a 104-35-4 mark in two separate stints at Southern Cal, the offensive coordinator of a BCS buster, and what appeared to be an up-and-coming coach from the FCS level. Now the Rebels have gone where (almost) no team has gone before and hired a coach straight out of Compton high school. Will this risky move succeed or are the Rebels doomed to be back at the craps table looking for a new coach in five years? Tony Sanchez has accomplished nearly everything at the high school level. Coaching at Bishop Gorman High School (in Nevada), he won a state title in each of his six seasons. Noticing his great success, and in need of a head football coach, UNLV hired him to lead their program in December. It is not unprecedented for successful high school coaches to transition to successful coaches at the FBS level. Art Briles and Gus Malzahn spring to mind as two former high school coaches who have enjoyed great success at the FBS level as well. However, both Briles and Malzahn began their FBS careers as assistants. Based on my research, the only coach in the last decade to jump straight from the high school ranks to an FBS coaching position prior to Tony Sanchez was Todd Dodge. Like Sanchez, Dodge was an uber-successful high school coach. Dodge coached Southlake Carroll High School in Texas to three consecutive state titles in the 5A classification before heading to North Texas prior to the 2007 season. The Mean Green had fallen on hard times, winning just five games in the two years preceding Dodge’s arrival, but they had experienced success in the not too distant past, winning four consecutive Sun Belt titles from 2001-2004 in the first four years of the conference. Dodge’s arrival did not produce a renaissance. In three and half years, his teams won just six of 43 games and finished with a 3-23 Sun Belt record. So the track record for high school coaches moving directly from Friday Night Lights to the top spot of an FBS program is both short and uninspiring. A sample size of one doesn’t tell us a whole lot about what to expect. In the absence of a good sample, let’s take a look at how UNLV performed the past four seasons under head coach Bobby Hauck relative to their conference brethren in terms of record, Yards per Play (YPP), Yards per Play Allowed (YPA), Net Yards per Play (YPP Net), Offensive Touchdowns (OTD), Touchdowns Allowed or Defensive Touchdowns (DTD), and Adjusted Pythagorean Record (APR). The number in parentheses is UNLV’s ranking within the Mountain West. The Rebels were below average in terms of Yards per Play for each season examined. In fact, based on Yards per Play, their ‘breakthrough’ campaign in 2013 was roughly equivalent to their 2012 season when they won just a fourth of their conference games. The Rebels were more efficient (or perhaps luckier) with their yards in 2013, ranking a respectable fifth in APR. That efficiency (or luck) deserted them (Las Vegas is in a desert, get it?) in 2014 and the Rebels were back to their losing ways. Despite their bowl appearance in 2013, the Rebels have not put an above-average mid-major team on the field in quite some time. How will Tony Sanchez do at UNLV? Your guess is as good as mine. He has not been on a college football staff since 1996 when he was a student assistant at New Mexico State. UNLV is obviously taking a big risk in hiring a high school coach to lead their program. However, a team like UNLV needs to take risks. If Sanchez fails, so what? He will be in lockstep with pretty much every other coach the Rebels have had. Instead of hiring a retread (see Turner, Ron) or a hot young coordinator (see McElwain, Jim), the Rebels took a chance on a local high school coach with a great track record (in high school of course). If nothing else, UNLV will likely give Sanchez plenty of time to succeed. Mike Sanford won two games each of his first three seasons and was allowed to stay for five years. Bobby Hauck did about the same, winning two games during each of his first three seasons without being fired. In fact, he was not even let go after the disappointing 2014 campaign as he submitted his own resignation. What college team could be more conducive to taking a big risk than one housed in Las Vegas? Sanchez may not succeed, but if nothing else, the Rebels have tried something different. Fifteen FBS schools will have new head coaches when the 2015 season begins. This semi-regular piece will analyze the teams and the coaches they have hired in order to offer a prediction regarding the schools’ prospects for 2015 and beyond. Our third stop takes us to the frigid northeast and the Buffalo Bulls. Buffalo won the MAC in 2008 under the guidance of Turner Gill. However, the Bulls were far from the best team in the MAC, so a decade long run at the top of the conference should not have been expected. After some anticipated regression in 2009 (though a 5-7 record at Buffalo should still be considered successful), Gill departed for Kansas and the Bulls hired Jeff Quinn as his replacement. Quinn had never been a head coach before save for two previous stints as interim head coach for bowl games at Central Michigan in 2006 and Cincinnati in 2009 (both times following the departure of Brian Kelly). Quinn was fired midway through his fifth season after a 3-4 start, and he finishes his Buffalo career with a middling 20-36 record. However, one could make the argument that he was relieved of his duties a bit prematurely. The table below lists Buffalo’s record, Yards per Play, Yards per Play Allowed, Yards per Play Net, Offensive Touchdowns (OTD), Touchdowns Allowed or Defensive Touchdowns (DTD), and Adjusted Pythagorean Record (APR). Keep in mind these numbers include conference games only and the ranking in parentheses is their standing against the rest of the MAC. As you can see, Buffalo steadily improved after bottoming out in Quinn’s first season as coach before becoming a MAC contender in his fourth season. After that breakthrough, some regression for year five should have been expected with the defense losing a top-ten draft choice in Khalil Mack. Sure enough, while the offense remained potent, the defense declined and the Bulls sputtered to a 3-4 MAC record (their game with Kent State was canceled due to hazardous weather). The Bulls fired Quinn after a 1-2 start in MAC play, and under his replacement, they split their remaining four games. So yes, the Bulls probably rushed in pulling the trigger on letting Quinn go (let’s not forget this team was 30-99 in the eleven seasons preceding Quinn's arrival since returning to FBS in 1999). However, despite their haste the Bulls may have actually traded up as they were able to nab Lance Leipold as his successor. Who is Lance Leipold? Growing up with The Simpsons, when I hear the name Leipold, this is what I think of. Alas, Lance is not that Leipold. This Leipold has been the head coach at Division III Wisconsin-Whitewater for eight seasons where he has compiled a ridiculous 109-6 record and won six DIII national titles. You might say Leipold had accomplished all he could at the DIII level. Now the Buffalo Bulls may have found a market inefficiency and hired themselves a great coach for the foreseeable future. Naw, who are we kidding? If Leipold has even a modicum of success at Buffalo, he will be snatched up by a Power 5 school in no time. What about the other point though? Are successful coaches from the lower divisions of college football (not intended to be a derogatory term) an undervalued resource? If they are, they may not be for much longer. From 2000-2012, seventeen FBS schools hired coaches away from lower-division programs (NAIA, Division III, Division II, or FCS); an average of roughly one and a half per year. These coaches achieved varying degrees of success and notoriety (from Jim Tressel to Mick Dennehy to Jim Harbaugh to Paul Wulff). This does not include successful lower-division coaches who took coordinator positions before moving up to FBS (like Hugh Freeze and Mark Hudspeth. In the past three offseasons nine such coaches have been hired by FBS programs, including six prior to the 2014 season. How do these coaches who move up from the lower divisions perform once they get to the big stage of FBS? To answer that question, I ran a regression analysis using the seventeen coaches hired from 2000-2012. I used 2012 as the cutoff because that means each coach spent at least three seasons at his FBS school. The dependent variable in the regression analysis was the coach’s winning percentage at his FBS school. A few housekeeping notes on winning percentage: First, I used winning percentage because it was simple and easy to calculate. A better measure would probably be winning percentage above or below recent historical precedent. I am very lazy, so feel free to follow up using that. Second, I only included the first FBS stop the coach made. For example, Jerry Kill was hired as the coach of Northern Illinois prior to the 2008 season. He coached the Huskies for three seasons before taking the Minnesota job. His Minnesota career has nothing to do with whether he was a successful hire for Northern Illinois. The dependent variables I used to predict winning percentage were tenure as a lower-division coach (in years), winning percentage at the lower-division, and games above/below .500 at the lower-division. For tenure, I used consecutive years as a head coach at lower divisions even if it was at different schools. Thus Jerry Kill’s experience at Saginaw Valley State (DII), Emporia State (DII), and Southern Illinois (FCS) count as fourteen years even though he never spent more than seven years at any one school. I figured a coach with a longer tenure would be a better bet than one with a shorter tenure. I used winning percentage because duh, that is the object of the game. I used games above or below .500 as sort of a more advanced version of winning percentage to give more credit to coaches who produce good winning percentages over a longer time period. The complete list of the seventeen coaches included in this study can be found at the end of this post. 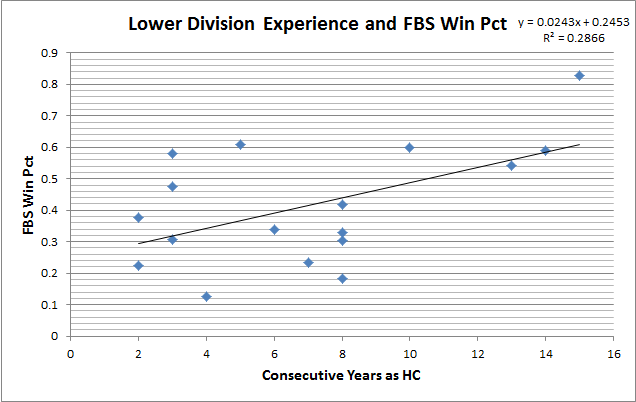 Here is the correlation for Experience and FBS winning percentage. Perhaps not surprisingly, the correlation is positive. In the aggregate, the longer a coach spends at the lower-division, the more successful they will be as an FBS head coach. The R Squared value of .2866 is on the low side, but all things being equal, a coach who spends a decade in the lower-divisions would be preferable to one who spent just a season or two there (I’m looking at you Mike London). 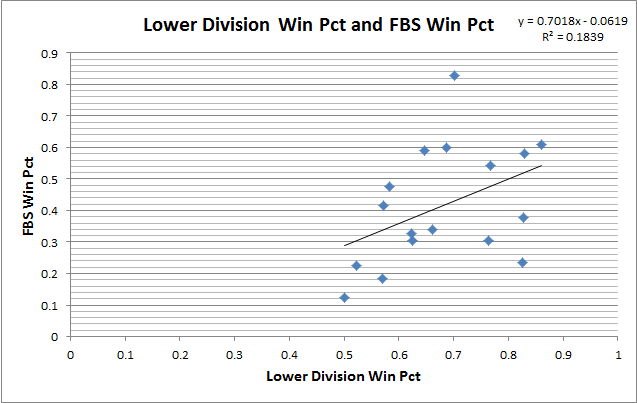 Here is the correlation for Lower Division winning percentage and FBS winning percentage. Again, the relationship is positive. It would of course be preferable for a lower-division coach to have a great winning percentage. The R Squared is lower than that for Experience, but there is probably a little selection bias at work here. Lower-division coaches who are not successful do not get FBS jobs. They get pink slips. 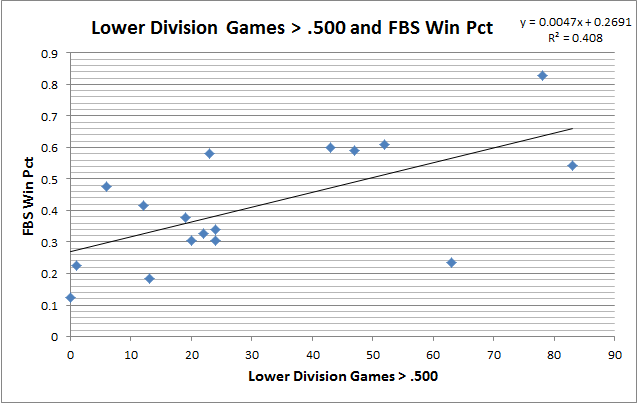 Finally, here is the correlation for Lower Division Games Above .500 and FBS winning percentage. Once again, the relationship is positive and the R Squared value is the highest of the three variables examined. Intuitively this makes sense. Games Above .500 is a combination of the other two variables, Experience and Winning Percentage. Games Above .500 can help us weed out some of the randomness. This is not a perfect analogy, and it involves a different sport, but consider Andy Enfield. He was the head coach of Florida Gulf Coast, a school that took the nation by storm almost exactly two years ago. Dunk City became the first 15 seed to advance to the second weekend of the NCAA basketball tournament. After their run, Enfield became the coach of Southern California, a huge step up from Florida Gulf Coast. However, Enfield had only two seasons of head coaching experience under his belt and a middling 21-15 record in the Atlantic Sun. Since being hire by the Trojans, his charges have won a grand total of five conference games in nearly two seasons. Without only a short track record prior to being named the head coach at Southern Cal, it’s likely the powers that be in LA were Fooled by Randomness. Andy Enfield just happened to be standing around when some good sh*t happened. We should all be so lucky. So back to Leipold. How does he measure up based on the three variables? Well, he spent eight years at Wisconsin Whitewater which is a solid run and makes him about average experience wise when compared to the lower-division hires examined in the study. His winning percentage of nearly 95% is tops by a healthy margin (Paul Johnson won 86% of his games in five seasons at Georgia Southern) and his games above .500 is twenty more than Brian Kelly accumulated in 13 seasons at Grand Valley State. If you are hiring a lower-division coach to lead your program, they don’t come much better than Lance Leipold. Add in the fact that Buffalo was probably a little better than their record indicated last year, and it’s easy to foresee a return to the postseason for the Bulls. As always, nothing guaranteed, but Buffalo appears to have made a great hire, even if he is likely at worst to double his number of career losses by the time he leaves upstate New York.